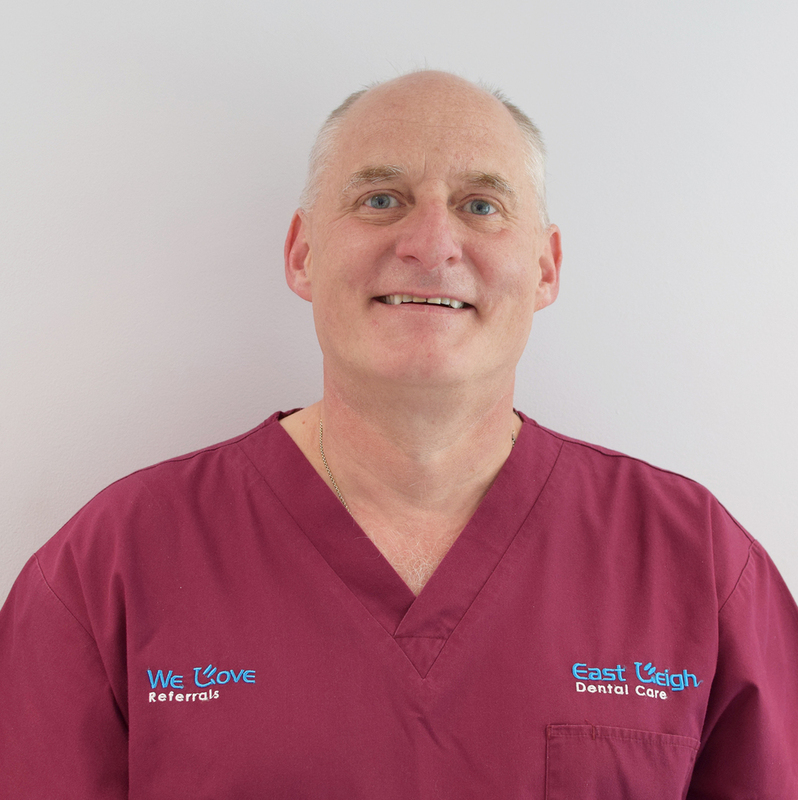 Mike qualified from Leeds in 1985 and established East Leigh Dental Care in 1992. Mike has a very keen Commitment to quality and even sat on the Education and Standards Committee of the British Dental Association. Mike taught at the Leeds Dental Institute and has been chairman of the Leeds and District British Dental Association and local Private Practice Groups. Mike uses the latest equipment including an operating microscope for all procedures. He delivers a very high standard of care and prides himself on providing dentistry as pain free as is possible. Mike also carries out extensive cosmetic dentistry and guarantees complete satisfaction. Always looking to improving his skills, Mike attends many development courses in excess of the minimum laid down by the General Dental Council. He is a highly professional and progressive Dentist, looking to provide the very best care available for you. Tracy started working at East Leigh Dental Care in September 2005. She is the head nurse in the practice and is responsible for the clinical side of surgeries. Tracy also has the task of being responsible for CQC, Cross Infection, Health and Safety and lots of other things too many to mention! Out of work Tracy enjoys socializing and spending time with her family. Kath has worked at the practice since 2008. She sees her main role as supporting Mike and making sure that she is available to discuss any problems with our patients, to make sure their treatment and appointments run as smoothly as possible. Kath has lived in Farsley since 2010 and enjoys not wasting time having to travel to work! She has three grown up children, a daughter-in-law, a grand-daughter and two step sons. Kath loves having friends and family to dinner and likes any excuse for a party! Becky qualified at Leeds Dental Institute in 2010. She joined East Leigh Dental Care in 2011. Becky also works within the community dental service, where she treats both adults and children. She has experience in treating patients with special needs and complex medical problems. Becky is particularly committed to preventative dental care and promoting education in dental care to patients. Out of work Becky enjoys spending time with her husband and children. Enjoys dancing and socialising with friends. Hazel qualified in 2011 from the Leeds Dental Institute and has been with us at East Leigh Dental Care since September, 2011. She has a 15 year background in dentistry. Hazel was a qualified florist before her dental career, working in Ireland, New Zealand and Yorkshire and has arranged flowers for the Queen! Hazel is married with 2 children and a dog called Henry. She likes socialising, going to the cinema and retail therapy. Matthew qualified from Sheffield University in 2010. He then worked in several posts in hospital and community dentistry to widen his knowledge. Since then he has worked predominantly in private practice, and bought East Leigh Dental with James in 2018. He has keen interests in cosmetic dentistry, sedation, orthodontic tooth straightening and Cerec immediate restorations. He also sits as a fitness to practice committee member for the dental regulator (General Dental Council), and is considering a Masters in dental negligence. In his spare time he enjoys his 3 Dachshund dogs, travelling and the theatre. Gill has worked at East Leigh since May, 2012. Prior to this she took a break from dental nursing and did clerical work for a while. Gill is married with three children and enjoys spending time with her family, going for walks and helping with her daughter’s horse. Emily joined East Leigh Dental Care July 2015. She qualified as a dental nurse 2014. She works here as a dental nurse and you will also see her on reception. She is involved in the marketing side of the practice too alongside Mike and Kath. Out of work Emily enjoys spending time with family, her boyfriend and friends. Enjoys eating out and plenty of retail therapy! Emily has a puppy called Belle which she adores! 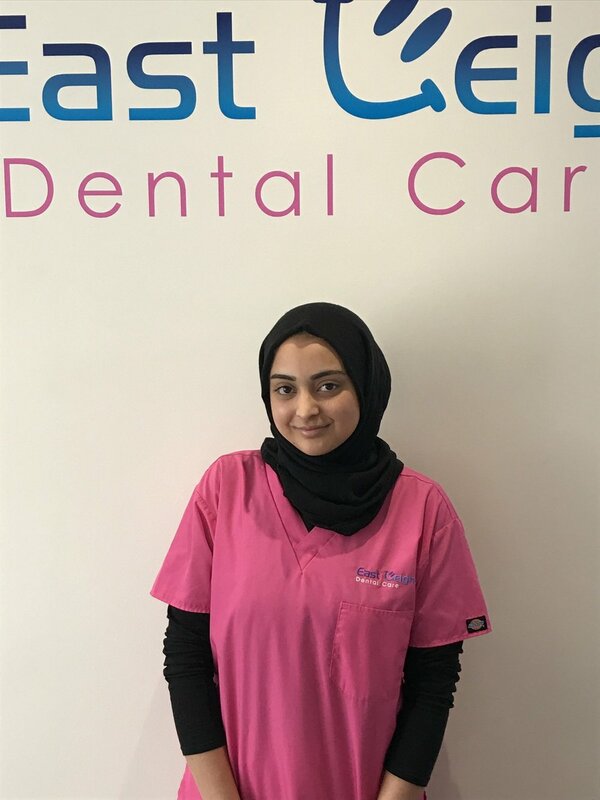 Arfa joined the practice in 2018, and is studying for her dental nursing qualification. Previously she had been in education, and worked part-time within the healthcare sector. In her spare time, she enjoys retail therapy and socialising with friends and family.